Last night Vov asked me if I had built the Machariel's yet. I told him that I had indeed built the first one. I've not had much free time so the second one is not yet together. He asked me if I was willing to do a trade for it. A bit before he asked about the trade he was tallying up his lot hauls from the past week or so. Vov has been playing with wormholes and doing DED complexes. He's produced a batch of Cynabals, an Ashimmu, a Gila (pronounced Geeeeee-Laaahhh just to upset people), some ascendancy blueprints for various grades and stacks of meta deployables. After he calculated them up he asked if I'd accept them for the Machariel. Without blinking I said, "Yes," simply because I thought the entire exchange was fun and it made me smile. (The Geee-Laaahhh is in another contract). I traded him the Machariel and collected my loot. I love building things. It is up in the air as to who got the better deal. It will take a little bit of work to build all of these new toys. I'm excited about it. It isn't a large project. I expect to have it all built by the end of the weekend and the excesses sold. I may keep the Ashimmu. I do not have one and I'm whimsically reminded of the one I purchased as a thank you for DP when he took a fleet to avenge my death once. I can combine some of my own exploration loot with them and see what I get out of the deal. I think I'll keep a few of the tractor units for myself. What is most fun is that we exchanged items instead of ISK. It's fun. 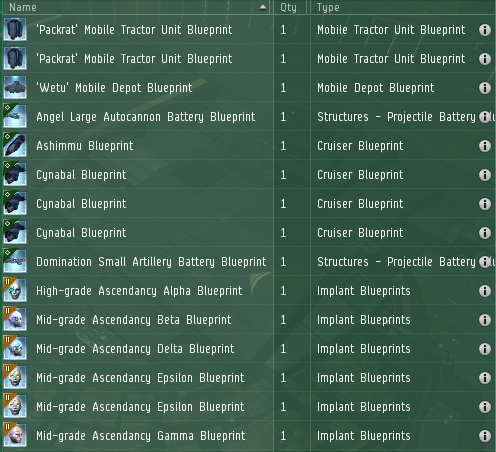 I spent time learning the various skills to build the blueprints that I found while doing exploration. I made a little bit of ISk off of doing that. None of it was the most efficient way to go around it but with my work schedule setting builds in the evening and doing a collection at the end of the week worked out nicely. I like little projects to. It is something of an in game hobby I guess. While I'm managing my market and trying to find new ways to save ISK and keep my prices down I do these little personal projects for my own income. In fact, I've been slowly working on my scattered assets. I have blue print copies stashed all over the region. Having once died with my shiny loot in my cargo hold I've learned to dump my cargo and transfer it to my blockade runners since often it is worth more than the ship. I'm also taking the time to reprocess down junk before Crius hits. I don't want to miss a mineral I could turn into more interesting stuff. I also do this for my Corp and the Alliance. A few people call me the Sugar Daddy of SMERG, lol. I enjoy teaching noobs how to scan down sites, collenct loot and sell back to me at fair market price. Once they have the skills and capitaol to make themselves! How fun it is fit and run around in our backyard.